'This time he spreads more than his arms. He finds wings,' declares Sukanya Verma. It takes Tolkien-sized vision to show how the smallest person can change the course of the future. Anaand L Rai's ambition aims sky high, but his creativity does not always match his cheek. When it soars though, Zero is a fun flight into whimsical connections and weird happenstances piloted by an entertainer adept in the art of lofty love. One has to submit completely to the idea of anything is possible to make sense of its curious story, which seems to unfold in an alternate reality. Often Zero feels like it's playing inside Bauua Singh's (Shah Rukh Khan) head, much like Big Fish's Edward Bloom, and offers a larger-than-life version of everything between Meerut and Mars. His romances are coloured in grand gestures and implausible adventure within illustrious surroundings. He bowls over scientists and stars alike, tosses a zillion notes in air and has a clever comeback -- written by Himanshu Sharma -- for all his shortcomings. The lavishness of his brash lifestyle is a means to overcompensate for his short stature (a pat on the back to Zero's VFX team) if not punish his small-minded father (an excellent Tigmanshu Dhulia) whose scorn and sperm rile Bauua no end. His amusing outburst makes a good case for evils of gutka. 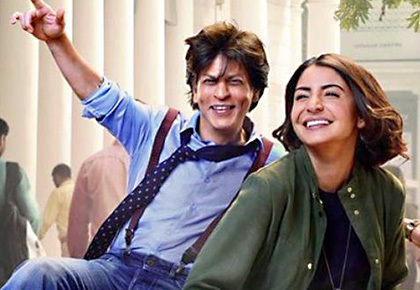 Although Dhulia and Sheeba Chadhha don't look old enough to play SRK's parents, their snappy banter and Zeeshan Ayyub's reprisal as his bumbling buddy (after Raees) does the job well. Zero is as much about this 38-year-old man-child amidst them as it is about his cinema soaked imagination. He's the hero of his daydreams rescuing the domestic help-in-distress from his daddy's villainy as well as a starry-eyed aficionado besotted by Babita Kumari's (Katrina Kaif) silver screen seduction. Shah Rukh Khan works up every breathing second of this bigmouth bum. Bollywood baits us to romanticise reality regularly. Bauua buys into it boldly. Sometimes paying lakhs to create the splendour of a courtship song. Sometimes by slipping into Shashi Kapoor's dancing shoes. Sometimes simply flicking stars like pieces of a carrom board. 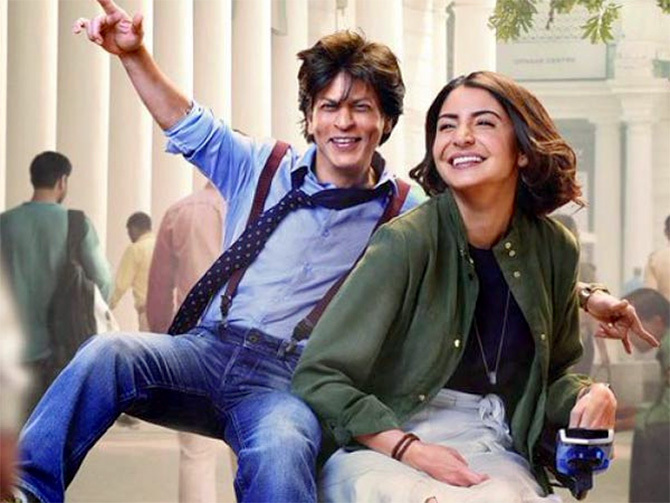 Bauua's coarse charm isn't lost on Afiya Yusufzai Bhinder (Anushka Sharma), the wheelchair-bound NASA brains affected by cerebral palsy. Not for long anyway. There's a disarming air to their match made in misfits heaven, which keeps us invested even after Zero drifts away into predictable tropes and soppy melodrama. Anushka Sharma's contorted expressions aren't particularly consistent, but it's a portrayal defined by warmth not affectations. The patience and assurance she conveys on learning her beau's need to stay a koyal(cuckoo) is all kinds of heart-warming. As Bauua's passing soul mate, Babita embraces her troubled stardom and his strange companionship with a lightness that reveals Katrina Kaif's little-seen vulnerability like never before. There's a moment in the car when her tall tales seem straight out of Bauua's fantasy filled imagination. She has your rapt attention throughout. And that is the only crucial thing Zero loses when it sends off its leading man on a NASA themed roller coaster. This time he spreads more than his arms. He finds wings.